The Play-Doh "Russ Family Factory" pictures are here!! Since all of the regular Play-Doh workers were on vacation this week we had to recruit 12 little workers to help us make some dough for Lila's birthday. The front door welcomed our friends with a "Welcome New Workers sign." As we waited for everyone to arrive we had a new worker orientation and let the kids color pictures that said "I love working at the Play-Doh Russ Family Factory". I let each "worker" pick their colored hat & wrote their name on it. Then I asked, "Who wants to help make some play-doh??" The answer was obvious!! When almost everyone was here we started the "Production Line". Each worker got to pick their "flavor" and color. (Kool-aid packets). Then they got to dump and mix, stir & smoosh their own batch of dough. After that they had to do a little "Research & Development". Then we moved on to some serious job tasks. "Product Testing" required them to see how well their Play-Doh rolled (bowling). Then they moved on to "Packaging" where they tried to get the dough into containers. Johnny and I dressed in uniforms of red & yellow & I made a cute sign to hang. As they left each worker was given the dough they had made and a "rolling pin" in a bag with this label on it. Attached to the bag were a few cookie cutters. Also, I have to admit (Rindi's comments are right) that a lot of the ideas for this party were Johnny's!! What a great dad!! Happy 3rd Birthday Lila Bean!! Kay LOVED Lila's birthday party! You did a great job, and I love that you and Johnny wore uniforms. You thought of everything! I can't wait for Lila's next birthday party. ;) I'll have to hire you and Johnny as party planners for Kay's next birthday party. You are AMAZING! 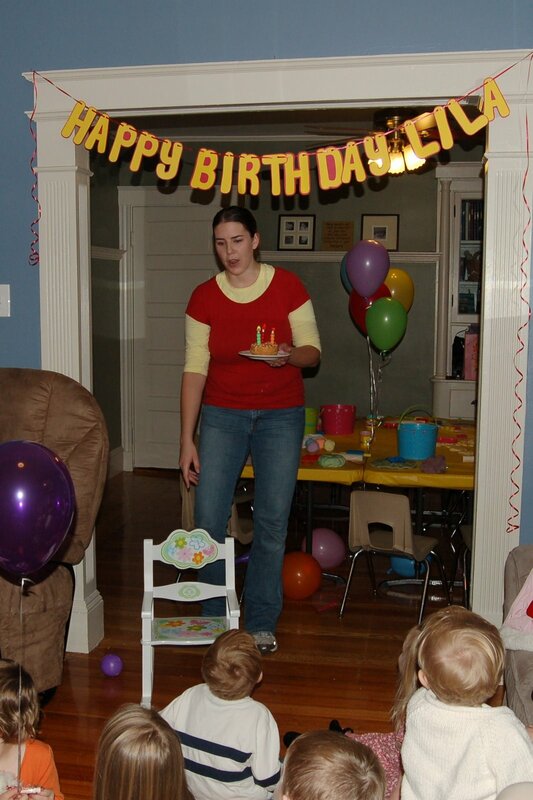 What a fun and unique birthday party. I love the cookie dough rolling pin...um..um.um. 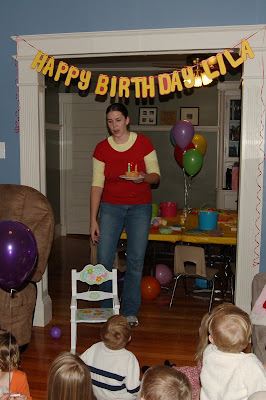 helloo emily..looks like everyone enjoyed the bday party..lila looks so cute..she is a big girl now!!! This is so cute. I must say I don't know how you make time for all this creativeness...you guys are great. Wish we could have been there. Happy B-Day Lila bean! So, so, so, cute. I was very impressed. Where do you find the time??? You are an awsome couple of parents!! Are guys nuts? And I mean that in the best way. Play doh time in our house means a bomb went off, lol. Happy Bday lil Lila. i love it!! your kids are so lucky to have you two as their parents!!! and lila is absolutely gorgeous!! how did she get to be 3?1?!?! You totally amaze me! This was the cutest idea! Juliette could not stop talking about Lila's party!! wow. Who knew there were so many typo's in the play-doh recipe. Nice! !